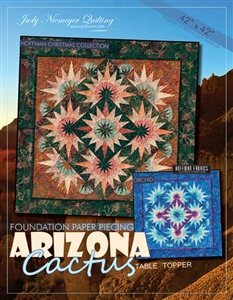 The Arizona Cactus Pattern is a redrafted version of Judy’s Tropical Sundance Block. The layout has been redesigned to accomodate a table top or coffee table and fabrics that compliment various seasons of the year have been used to make our samples. An excellent project for someone new to paper piecing, it includes enough papers to make two table toppers and also covers many of Judy’s basic paper piecing techniques without involving a signficant number of blocks. If you are looking for a project you can pull together in the weekend and have a great time choosing colors, this is an excellent option for you! The Quilt finishes to 42″ x 42″. Join Patti & Nancy as they show you the Tricks of doing the Center Spike Block Unit Assembly, Floating Points, & Curved Piecing.